From Harris Avenue, to Valley Street, to Eagle Square, Olneyville and its cohort of once-abandoned mills is famous for its formerly underground art scene, full of squatters and spirited rebels: Now, with the city having cracked down on safety issues and as rising rents in Providence’s center have pushed people outwards, Olneyville is growing in some very new and exciting ways. As newcomers generally strive to respect and preserve the area’s architectural landmarks and its already existent communities, and with a spirit of neighborly collaboration, innovations in arts, culture, nature, and dining are thrusting Olneyville into the spotlight. 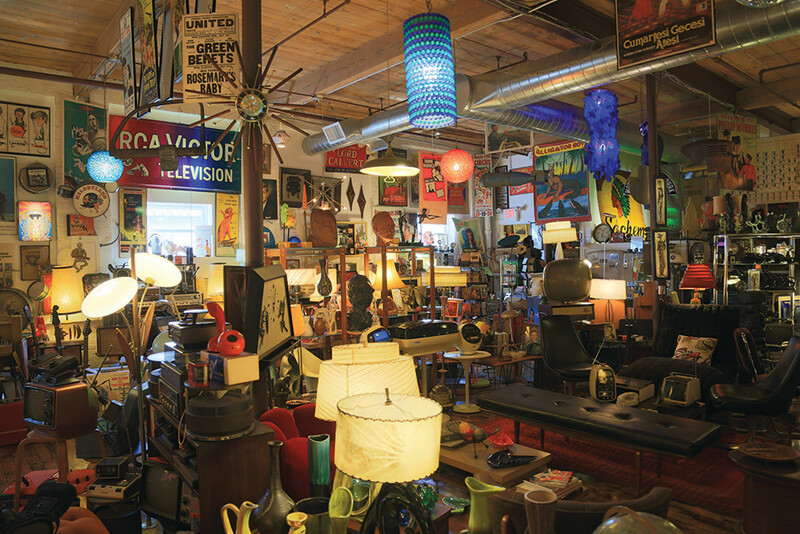 Olneyville is all about creative spaces, like the one-of-a-kind hidden treasure on West Park Street: Pop Emporium. Owner Darren Hill has worked in the music industry for decades and toured the world picking up unique vintage pieces that catch his eye. His collection spans eras, even containing dinosaur bones and ancient meteorites, but is mainly focused on 1950s-70s pop culture memorabilia. Speaking of incubators, one artist collaborative that has been fostering creative work under the radar for decades is Ajay Land Co. The massive mill along Harris Avenue which finally opened its doors to the public in July 2017, as part of the Valley Arts District open studios, quietly thrived underground through decades of pressure from nearby high-end condos and stringent city officials. Joann Joseph is the daughter of Anthony Joseph (thus A.J. or “Ajay”), who purchased the mill in 1978 and rented out lofts to creatives, and she took over when her father retired. When a small fire occurred in 1998, the city cracked down, and artists could no longer live in the lofts, which were converted to studios and rented to about 40 painters, ceramicists, musicians, clothing and jewelry designers and more, including RISD professors and Brown graduates. Then there’s Grin Gallery, just a few doors down from Troop, which opened in 2013. Co-founders and directors Lindsey Stapleton and Corey Oberlander moved to Olneyville for its affordability and supportive creative community, and because they saw an unfulfilled niche in the local arts scene. The gallery showcases and exhibits “emerging or underexposed” interdisciplinary artists: “artists who are making things purposefully, thinking about every aspect from conception, to why they’re making the work, to how they’re executing it, to how it’s installed,” in Lindsey’s words. The gallery is structured as a sparse, “bright cube” with no text on the walls to explain what the art is, leading viewers to engage more with the work. “We show work that people can immediately identify and ‘get’ on some level even if they don’t have an art degree, and from there we can have a conversation with them and hear what they think rather than telling them ‘this is what the piece is, and this is what the show is,’” says Lindsey. The couple curates larger group shows once or twice a year at the gallery, and about half of the artists they exhibit come from outside of the New England area – important “for artsts not based in major cities,” Corey points out. The Wilbury Theatre Group recently transformed an old mill space into a brand new performance venue on Sonoma Court. The innovative theater company, founded by Josh Short in 2010, differentiates itself with a “scrappy, cutting-edge, less-is-more” approach, “focusing on the development of big work, providing a home for local artists, and trying to champion the do-it-yourself methods to engage audiences,” Josh says. One of the most exciting developments has been the arrival of WaterFire to the neighborhood. The crown jewel in Providence’s recurring cultural events lineup debuted its new Arts Center on Valley Street this past spring, in a former U.S. Rubber plant from 1929. 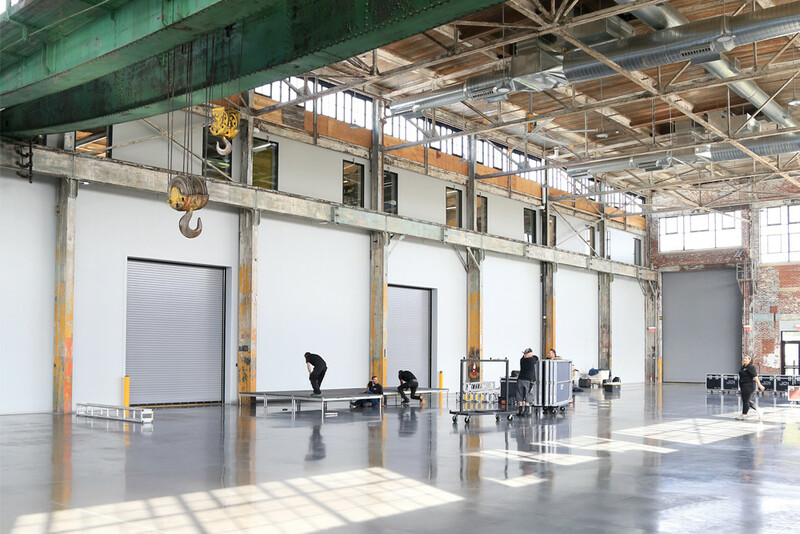 The current state-of-the-art space houses the organization’s offices, fleet of trucks and supplies and hosts events for WaterFire and countless partners, as well as classes and lectures. Executive Artistic Director Barnaby Evans shares that historic renovation tax credits from the city were key to being able to clean up old contamination and environmental conditions and installing brand new windows, plumbing and electrical systems, as well as elevators and ramps for handicap accessibility. Many historic details have been preserved, including a 15-ton industrial rolling crane and 40 feet of the railroad tracks – and, of course, “that old robust, muscular architecture that we love,” says Barnaby. The goal was to make the space as flexible and versatile as possible to facilitate community partnerships of all kinds and further WaterFire’s mission of inspiring the community. “Having this space allows us to be helpful in many different ways,” says Barnaby. More than just a base of operations for WaterFire, the Art Center is primed to be a creative hub for the surrounding area. 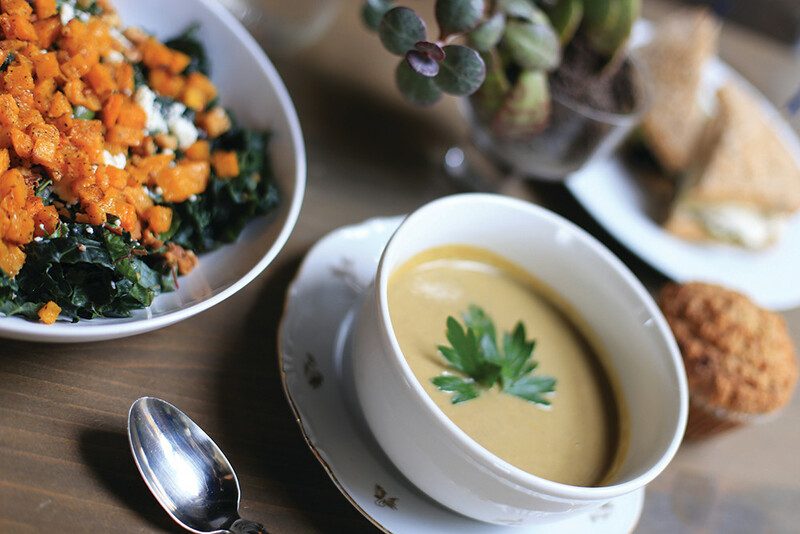 Troop is the anticipated new restaurant, bar and brainchild of the folks behind Laughing Gorilla catering, which launched in January 2016 with a focus on made-from-scratch global street food favorites. After operating out of Kitchen’s space on Carpenter Street and doing popup stations and events all over the area, owners Jason Timothy, Leigh Vincola, and Sean Larkin – owner of Revival Brewing Co – teamed up with Chris Simonelli for this next chapter in the Laughing Gorilla team’s evolution. Occupying the vast millspace on Valley Street which previously housed Bocado and Cuban Revolution, the team brought in Kyla Coburn Designs (responsible for designing hotspots like North, Wara Wara, and The Avery) to bring the vision of Panamanian skate and surf meets early-hip hop and punk rock to life, incorporating skateboards for barstool backs, a hip hop periodic table of elements, potted tropical plants, a huge mural of golden age musical legends, and vintage signs and themed tchotchkes as accents. Troop opens this month, and the bar will serve healthier options like smoothies alongside alcohol, with lunch and breakfast opportunities eventually. Just up Valley Street, catering company Easy Entertaining hosts clients and diners in its bright, sunny space at Rising Sun Mills, with a cafe open for breakfast and lunch. Owner Kaitlyn Roberts has a strong tie to Rising Sun: “It was a jewelry company, Victoria & Co., and my father worked there for many years,” she says. As an adult, she moved in when the mill was converted into residences. “I watched four businesses go in and out in this space in less than five years,” says Kait. She finally approached her landlords about relocating her catering business there from an office in Hope Artiste Village and a shared kitchen in Dartmouth, MA, and they agreed – with the stipulation that she add a cafe. Since the relocation, gross profits for the business have doubled. Kait is planning to expand the kitchen outwards and to spruce up new offices in a building nearby, with Olneyville neighbor Libby Slader doing the interior design. “Olneyville lets me be me and Troop be Troop and L. Sweet Lumber be L. Sweet Lumber,” Kait says. “Everybody ‘does them’ and we all get along.” And one more culinary neighbor will be arriving in the coming years: a new food hall on West Park Street from Eat Drink RI (EatDrinkRI.com), including dining as well as food and drink production. The Woonasquatucket River Watershed Council has played an essential and sometimes overlooked role in revitalizing the area, cleaning up the river and its surrounding parklands since the late 1990s. 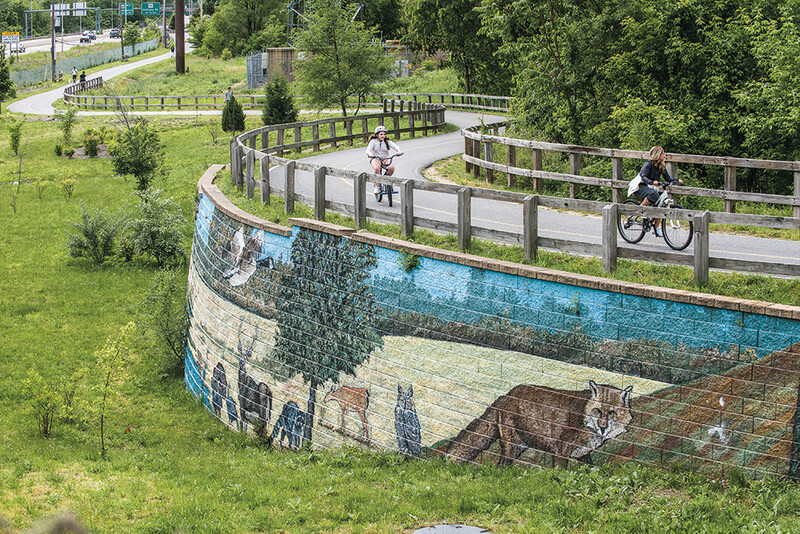 By adding green infrastructure to urban areas, WRWC “uses nature to mitigate stormwater issues, clean the water, and prevent flooding while also beautifying the area,” says Executive Director Alicia Lehrer. WRWC recently completed a bike path behind Rising Sun Mills, and as of this writing are getting ready to construct a section of greenway on San Souci Drive behind Olneyville Square for an off-road bike lane. The hope is to one day connect the bike lanes on Broadway, through Olneyville Square, all the way down to Riverside Park. Alicia credits The Olneyville Collaborative, an initiative created by One Neighborhood Builders, for spearheading efforts with many different groups and individuals to revitalize the community through volunteer efforts and fun and exciting programming for area residents. WRWC has also created a park stage, playgrounds, murals and mosaics. Alicia maintains that Olneyville’s renaissance has been in the works for decades thanks to community dedication and collaboration. “We are a model community not just for Rhode Island, but for the rest of the country in terms of how we all work together,” she says. As the Woonsquatucket and its fishy residents come alive once more, so do many old abandoned mills that once generated the creative birth of the Industrial Revolution in America. As long as care is taken to preserve the historic richness and not to displace the current residential community while keeping space affordable for artists and creators, Olneyville might indeed serve as a model not just for Rhode Island communities but for the nation as a whole. Many changes are still in the works, but in the meantime, it’s definitely worth exploring both the new and the older facets of what Olneyville has to offer.